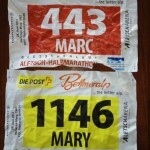 The race starts in Bettmeralp, but by the time I got around to making a hotel reservation, Bettmeralp was booked solid. So we’re staying 3 km away in Riederalp. Both villages are car-free zones, reached by cable car from the valley below. We’re planning to jog over to the start and then back again after the race. It’ll be a good warm-up and cool-down, Marc says. Right. I can’t sleep. Too hot under the thick eiderdown, too cold without it. I feel like Goldilocks. I get up twice and do my yoga stretches. I toss and turn. I remove the eiderdown from its cover and use that instead. Marc sleeps blissfully along as usual, oblivious. Finally I drift off at about 2:30. In the morning after a light breakfast, we jog over to the start and get our numbers. Marc suggests we check out the first part of the course. 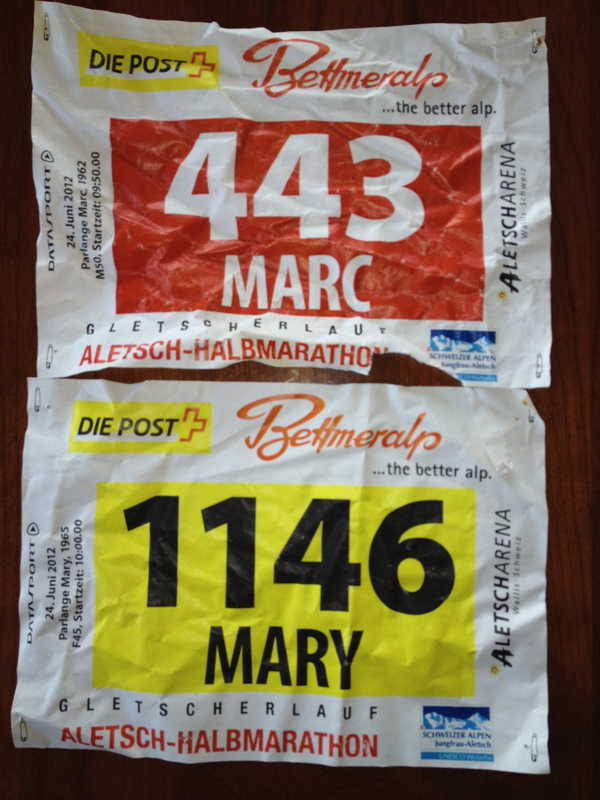 We walk past hordes of fit-looking runners streaming towards the check-in point, through the village of Bettmeralp and on beyond, Marc doing what he always does before a race – concentrating on his plumbing. The most important thing you can do before a running event like this is equilibrate your digestive system. If you have unfinished business when the race starts, you’re in trouble. There will be no portapotties along the route. So runners are understandably somewhat preoccupied with this before a race. But Marc, bless his heart, takes things a notch further. Pre-race, he enters an intensely focused mindset in which his entire world is reduced to the state of his G.I. tract. Every twinge becomes an emergency. He’s forever dodging into bathrooms, behind bushes, and then coming back and informing me of the success or failure of the effort. We cover two kilometers, Marc dashing in and out of the bushes, the road turning to dirt and winding gently uphill. I think we should turn back, I say, adding up all this extra mileage in my head. A half-marathon is long enough, thank you very much, never mind tacking on ten extra kilometers. We carry on. No horrible hill in sight. Finally I announce that I believe him, that I’ll take it easy at the start, and that I’m turning back. I don’t want to wear myself out before this thing even starts. Back at the starting line, Marc has one last pee, and then dashes off again saying he has a gastric situation. We part company and I stand in my pace group, wondering if he’s going to make it back to the starting line in time to leave with his group. At 10:00, my group finally leaves. The horrible hill materializes at about 3.5 km, but it’s not that horrible. Some people start walking, but the trail is wide enough that I can get around them and maintain a jog. Soon the trail narrows to a single track and levels off, and a long line of runners stretches out before me. I’m fine just running along comfortably, but many other people aren’t. Throughout the entire race people jockey for position, impatiently dashing out the minute there’s an extra foot of space to pass. I succumb a few times when I find myself behind someone who’s running way too slowly for comfort. It’s slightly unpleasant to run with someone tailgating you. At several places the trail widens again into a road, and the pressure of passing eases off. I keep thinking how nice it would be to run this without all the other people on the trail. There’s something about it being a race that gets me stressed. After we pass through Riederalp, we hit the first really brutal hill, and I have to walk along with everyone else. 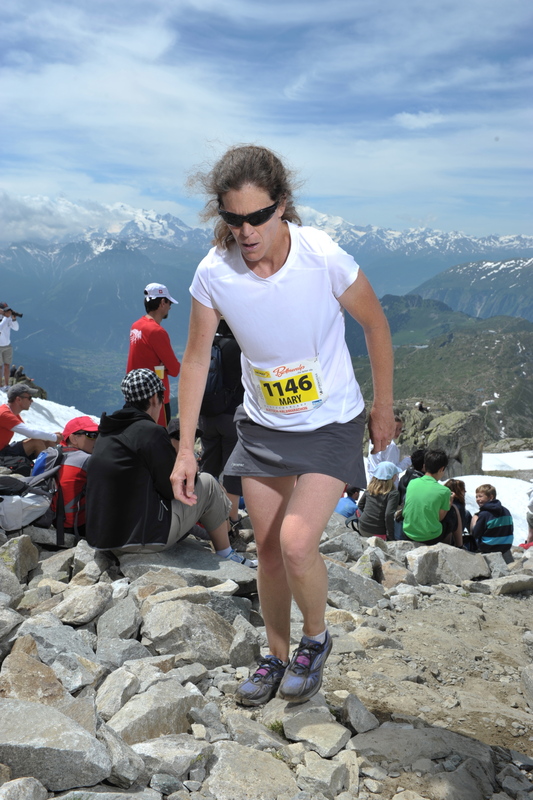 I’m feeling the altitude; we started at 1950 m. Gamely I try to pass some people – I’m strong on the uphills! – but it’s hard with so little oxygen to breathe. After that hill, there’s a long, lovely stretch through some forest, a carpet of pine needles underfoot. I concentrate hard, though; there are lots of rocks and roots, plenty of opportunities to faceplant if you’re not paying attention. There’s a nice vertical dropoff on the left hand side of the trail as well. I’m doing well, staying upright, feeling good. Every now and then, there’s a little flattish section. Just enough to keep me going. And then the uphill resumes and I’m in agony again. At one point, I think my legs are going to cramp up, so at the next water stop I take electrolyte fluid and eat some banana. This race is really well organized; they’ve put tables out way up here on the mountain, and there are people offering water, tea, isostar drink, bananas and pieces of powerbar. I start to get passed by people, including women younger, older, my age. I am so impressed by their fitness. My legs and lungs are at their limits; there’s no pulling this old body up this slope any faster than I am, which at the moment is a fast walk. I am profoundly humbled. 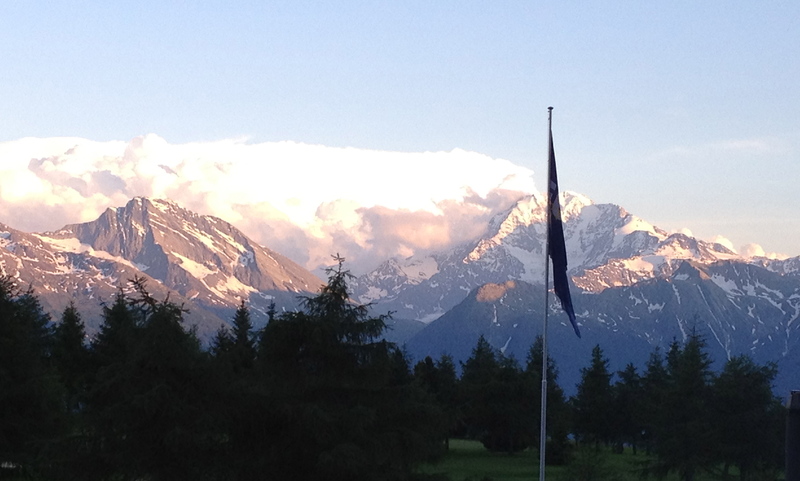 The view across the glacier is magnificent, but I can hardly appreciate it. The insides of my sunglasses are coated with salt. At the lifesaving aid station at 19km, I take more isostar and banana and stop for a few seconds. There’s a blissful flat section, but ahead and above I can see the top of the Bettmerhorn lift, my destination. I know there’s still a big climb ahead of me over that last 2 km. It’s a good thing I read Dean Karnaze’s book “Ultramarathon Man” last week. He talks about hitting the wall and then somehow finding the energy to carry on. “Run when you can, walk if you have to, crawl if you must; just never give up.” I tell myself: If he can run 199 miles, I can finish this race. I stopped worrying about running a good race a long time ago. Now I’m just trying to get to the top without my legs cramping up. At one point, I almost start to hyperventilate – it reminds me of when I was a child and I would dissolve into gasping tears when I felt I was at my physical limit. I make a conscious effort to calm down and breathe deeply, and the moment passes. Cheering supporters line the last br utal climb, and finally, I hear Marc’s voice. C’mon Mary! Just a little more! It flattens out and you can run to the finish! I take heart at his words, find one last shred of energy deep within me and haul my corpse up those last meters. It does flatten out and I amaze myself by jogging to the finish line, (getting passed in the last 2 meters by another woman). Someone rips the chip off my bib and someone else hands me a red long-sleeved t-shirt. Tears fill my eyes, I’m so glad to be here. I’ve never experienced anything like this in a race before. Must be the altitude. Marc finds me and takes care of me, bringing me water, isostar and bananas. I change into my new finisher t-shirt and collapse onto the ground, just happy to be here and not climbing. Lying down never felt so good! Marc ran a great race, faster than his 2003 time by almost a minute, and he’s feeling great. It’s a huge advantage, knowing what the course is like, he tells me. I don’t really care any more what my time is, I’m just proud to have finished and humbled beyond words at the strength and stamina of all these people around me. We take a gondola car back down to Bettmeralp and gently walk/jog the 3km back to our hotel, where a shower awaits. On the train ride home, we crack through our 500 gram bag of pistachios (sodium and potassium replenishment!) 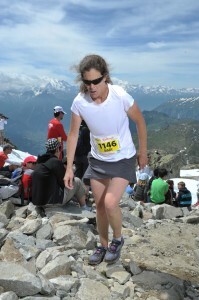 and contemplate other mountain races we’re going to do this summer of Marc’s 50th birthday. We might as well take advantage of our hard-earned fitness. 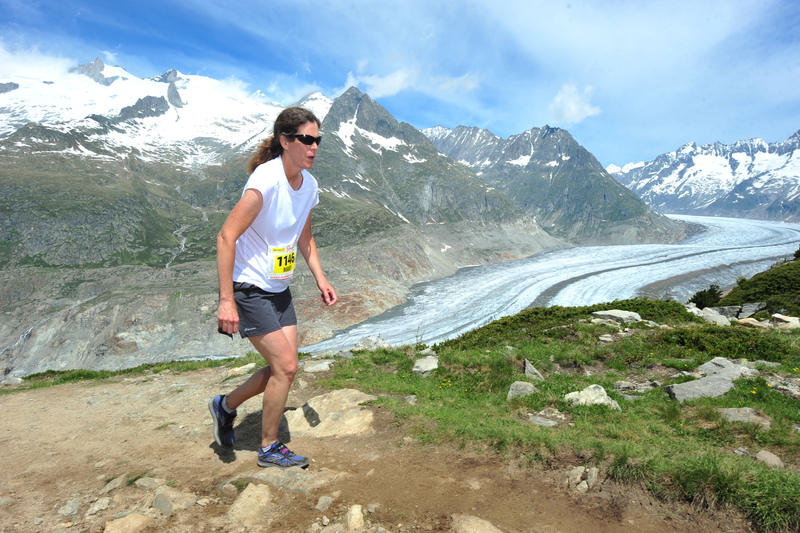 Tour des Alpages, July 21; Thyon-Dixence, August 5; International Matterhorn run, August 26. Anybody want to join us? In between, we can just head up to the moutains and take our pick of beautiful trails for training. It’s tough, living in paradise like this. 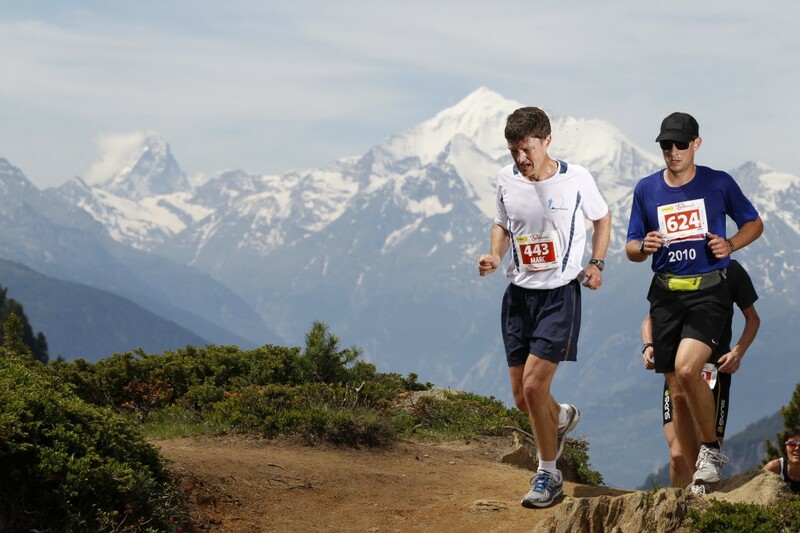 This Saturday, we’re doing the 24km Tour du lac du Joux up in the Jura. It’ll be interesting to see how it feels to run at a lower altitude. This entry was posted in Family, Moment of Beauty, Running, Switzerland and tagged race report, running, trail running by gydle. Bookmark the permalink.